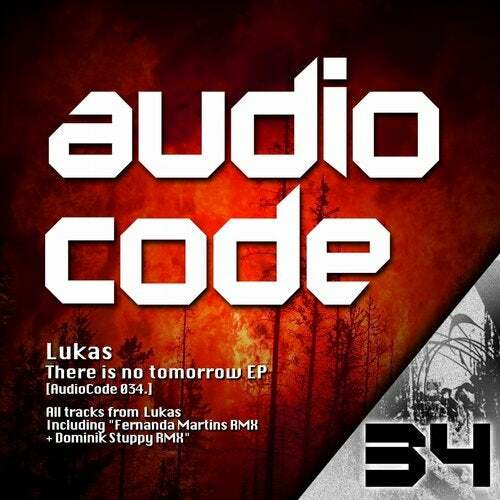 Lukas presents 'There is no Tomorrow EP'. After almost 15 years in the scene, the Brazilian Hardtechno Master wanted to take the opportunity of his upcoming anniversary to produce his first EP on his own label, AudioCode Recs. AudioCode #34 features 3 creations by one of the leading and most respected artists in the Hard Techno scene, which worked with all his (passion and) determination to show 3 different main traits of this genre in each track! 'There is no Tomorrow' is a dance floor devastator thanks to its amazing Hard loop, dancing groove, and to the unmistakable vocal in the break that already made this tune one of the hits of the season. 'Broken Bones' brings a much deeper feeling. It has a clean, but powerful drum loop, a swaying bassline, and a remarkable synth line that drives this tune forward into the right direction. 'Hat Trick' was built around a complex harmony between many synths - that summed up with its straight and tight main loop - gives to it a punchy beat that puts any dance floor upside down! To complete this awesome EP, this time we feature 2 remixes. One by Fernanda Martins, another of the most known figures in the Hard Techno scene; who contributed with a faster and much heavier version of 'Broken Bones'. Finally, a remix from the German newcomer Dominik Stuppy who brought a very clean and original remix of 'Hat Trick'.